Well on BKD TV, here’s a recap of Week 2 of the 2014 NFL Season with a Tuesday Afternoon QB & thanks again to AP Sports/ Pro 32 for photos & articles. Baltimore Ravens inside linebacker C.J. Mosley (57) celebrates his fumble recovery, near Pittsburgh Steelers quarterback Ben Roethlisberger (7) during the second half of an NFL football game Thursday, Sept. 11, 2014, in Baltimore. The Ravens won 26-6. After watching the Pittsburgh Steelers stumble their way through a lopsided defeat, coach Mike Tomlin bemoaned an opportunity lost. Facing a Baltimore Ravens team that endured a tumultuous short work week following a season-opening defeat, Pittsburgh made one mistake after another in a 26-6 loss Thursday night. The Steelers (1-1) turned the ball over three times, leading to 10 Baltimore points. Quarterback Ben Roethlisberger struggled to establish any sustained momentum on offense, and Pittsburgh was penalized nine times for 75 yards. Playing three days after running back Ray Rice was released, the Ravens (1-1) got a pair of touchdown passes from Joe Flacco in a bounce-back win following a 23-16 home loss to Cincinnati. Rice was reaching the end of a two-game NFL suspension for domestic violence when a video of him striking his then-fiancee surfaced Monday. By the end of the day, the three-time Pro Bowler had been cut by Baltimore and suspended indefinitely by the league. 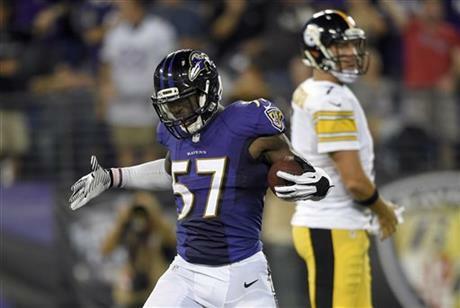 But the Ravens proved to be resilient against their AFC North rivals. Bernard Pierce took over for Rice to gain 96 yards on 22 carries as part of a ground game that finished with 157 yards. Flacco went 21 for 29 for 166 yards and two TD throws to tight end Owen Daniels, and Justin Tucker kicked four field goals. Pittsburgh finished with only 22 fewer yards than Baltimore, but the turnovers made the difference. One Steelers miscue halted their opening drive, another set up a fourth-quarter field goal by Tucker, and an interception thrown by Roethlisberger with 1:51 remaining ended any hope. It was only the second time in the last 11 regular-season meetings between the teams that the outcome was decided by more than three points. Roethlisberger completed 22 of 37 passes for 217 yards. It was the first time since Nov. 26, 2006, that Baltimore held Pittsburgh without a touchdown. Cincinnati Bengals running back Giovani Bernard (25) dives into the end zone for a 4-yard touchdown in the first half of an NFL football game against the Atlanta Falcons. Without receiver A.J. Green on the field to make a big play, Andy Dalton called out to his running back whenever he was in a bind. Somehow in all the commotion, Giovani Bernard heard his name and looked for the ball. 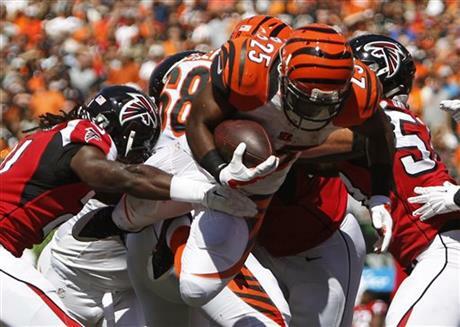 The second-year running back picked up a depleted offense by running for 90 yards and turning Dalton’s under-duress passes into big plays on Sunday, leading the Cincinnati Bengals to a 24-10 victory over the Atlanta Falcons. All around the field, the Bengals have a good thing going right now. They won their home opener and improved to 2-0 for the first time since 2006 despite losing several key players to injury, most notably Green. The Pro Bowl receiver aggravated an injured toe on his right foot, which kept him out of practice last week. He left during the opening series and didn’t catch a pass for the first time in his four-year career. Cincinnati still put up some impressive numbers against the Falcons (1-1), who gave up nearly 500 yards for the second straight game. The centerpiece was Bernard, who ran 27 times for 90 yards, including a 4-yard touchdown. He also caught a team-high five passes for a career-high 79 yards, including a 46-yard catch-and-run when Dalton flipped the ball to him as he was getting hit. The Bengals wound up with 472 yards and averaged 6.8 yards per play. Rookie Jeremy Hill ran for 74 yards and a touchdown, and the Bengals rushed for 170 overall. Cincinnati’s biggest challenge was to shut down Matt Ryan, coming off the best game of his career. Ryan threw for a club-record 448 yards and three touchdowns in an opening 37-34 overtime win over the Saints. The Bengals’ blitzing defense got to him. Ryan was 24 of 44 for 231 yards with one touchdown and three interceptions, one of which set up Hill’s 1-yard touchdown run for a 24-3 lead in the third quarter. Nothing new about the Bengals holding down a top passer. Last season, they got the best of Aaron Rodgers, Tom Brady, Matthew Stafford, Andrew Luck, Philip Rivers, Joe Flacco and Ben Roethlisberger on their way to the AFC North title. On the Jacksonville Jaguars’ second offensive play, rookie receiver Allen Hurns was wide open down the right side of the field, at least 5 yards beyond cornerback DeAngelo Hall. Chad Henne spotted him and delivered the ball on the money. It landed right in Hurns’ hands. And he bobbled it. And he bobbled it some more. And then it fell to the ground. Had Hurns caught it and kept running, the Jaguars would have had an early lead on the Washington Redskins. Instead, they didn’t score until they were in a three-touchdown hole Sunday on the way to a 41-10 beatdown. Maybe that one play wouldn’t have changed much, but Hurns — the undrafted receiver who was a big surprise in his pro debut the previous week — had made a big rookie mistake. 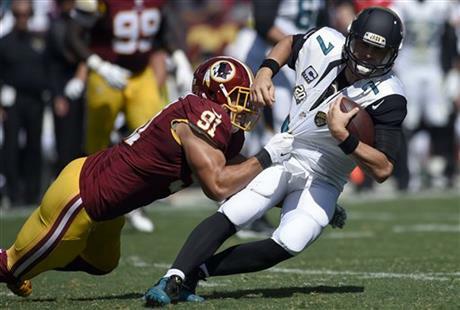 The loss dropped the Jaguars to 0-2 for the third consecutive season. Henne was sacked a franchise-record 10 times. The Jaguars gained 148 total yards — and 117 came on two plays. The Jaguars showed some promise in their season opener, taking a 17-0 over the Philadelphia Eagles before losing 34-17. Hurns even earned a spot in the record books, becoming the first player in league history to catch two touchdown passes in the first quarter of an NFL debut. But they didn’t get past midfield against the Redskins until they were trailing 21-0 in the final two minutes of the first half. That means they allowed 55 unanswered points over parts of two games — until Henne hit Marcedes Lewis for a 63-yard score with 1:40 to go in the second quarter. C.J. Spiller gave a knowing wink when assessing the impact the Buffalo Bills’ dynamic “Clemson Connection” made in a home-opening 29-10 win over the Miami Dolphins on Sunday. Spiller, the Bills’ 2010 first-round pick out of Clemson, scored on a 102-yard kickoff return on the team’s first touch of the ball in the third quarter. And first-round pick Sammy Watkins, the latest Tigers player to join Buffalo’s ranks, capped the next drive with a 12-yard touchdown catch. The Dolphins (1-1) had no answers against their AFC East rival. Worse still, Miami sustained a potentially big blow when running back Knowshon Moreno, a key offseason addition, did not return after hurting his left elbow 11 minutes in. The injury looked serious, though coach Joe Philbin had no update on Moreno’s status following the game. 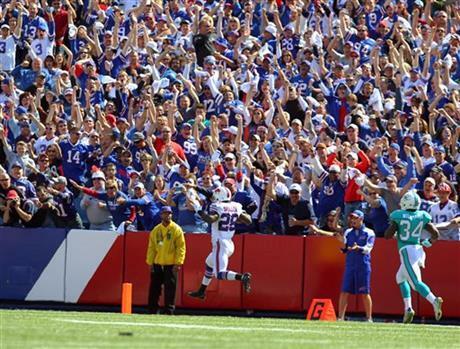 The Bills provided electricity to a charged-up crowd during a week the franchise celebrated its proud past and promising future. The game began with a tribute to Hall of Fame owner Ralph Wilson, who died in March. And it came during an uplifting week in which the franchise’s long-term future was essentially secured: Wilson’s trust reached a “definitive agreement” to sell the team to NHL Buffalo Sabres owners Terry and Kim Pegula for an NFL-record $1.4 billion. Bills President Russ Brandon nearly broke down in tears afterward. Dan Carpenter hit five field goals and the Bills had four sacks in helping Buffalo get off to a 2-0 start for the first time since 2011, and only the sixth time since 2000. The game was decided during a 9:10 span in the third quarter, and after Caleb Sturgis capped the Dolphins’ opening drive by hitting a 34-yard field goal to cut Buffalo’s lead to 9-3. The New England Patriots took full advantage of Adrian Peterson’s absence, though he might not have made much of a difference. Six sacks, four interceptions from Matt Cassel and a blocked field goal for a touchdown doomed the Minnesota Vikings Sunday, as the Patriots breezed to a 30-7 win, coach Bill Belichick’s 200th. Tom Brady went 15 for 22 for 149 yards, one touchdown and no turnovers, and Cassel’s first start against his close friend and former mentor was a dud. Devin McCourty, Darrelle Revis, Logan Ryan and Dominique Easley all picked him off, setting up 17 points for the Patriots and prompting chants from the crowd for rookie Teddy Bridgewater. Cassel finished 19 for 36 for 202 yards. This was Brady’s 149th win as a starter, pushing him past John Elway into third place on the all-time list behind Brett Favre and Peyton Manning. 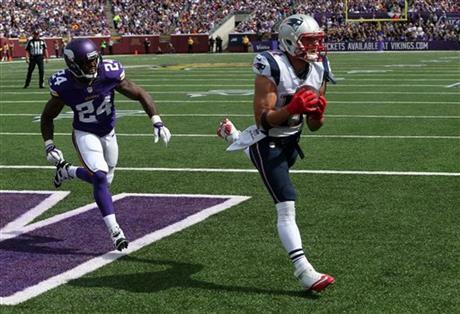 Stevan Ridley carried 25 times for 101 yards, and Vikings cornerback Xavier Rhodes wasn’t able to keep up with Julian Edelman, who finished six catches for 81 yards and a touchdown. The Vikings started strong with a 25-yard touchdown pass from Cassel to a wide-open Asiata, followed by the defense forcing a three-and-out. But one bad throw by Brady’s former backup shifted the momentum. The Dallas Cowboys avoided an 0-2 start by bouncing back in a big way thanks to a dominating performance from DeMarco Murray and their beleaguered defense. 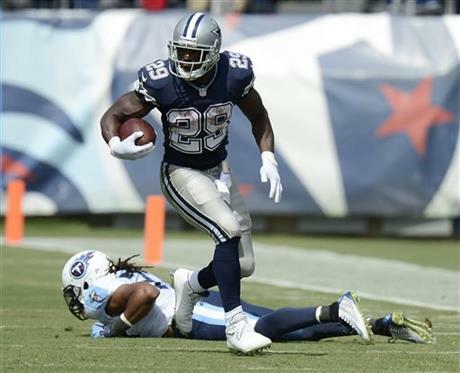 Murray ran for 167 yards and a touchdown, Dan Bailey kicked four field goals, and the Dallas Cowboys beat the Tennessee Titans 26-10 Sunday. The loss spoiled Tennessee first-year coach Ken Whisenhunt’s home debut. The Cowboys haven’t started 0-2 since 2010 when Wade Phillips was fired midway through the season and Jason Garrett was promoted to head coach. They didn’t come close to staying winless Sunday, jumping ahead 16-0 in the first half to kick off a two-game road swing strong. The Dallas defense had two sacks and two interceptions that led to 10 points. Romo easily shook off his three interceptions in the season-opening loss to San Francisco. With Murray running so well, Romo was 19 of 29 for 176 yards and a TD. The Titans (1-1) struggled in all areas after winning their opener at Kansas City and missed on their first 2-0 start since 2008. Cam Newton showed he has no intention of changing the way he plays the game. The fourth-year quarterback shook off some early rust and returned to his fearless style of play, helping Carolina defeat the Detroit Lions 24-7 on Sunday, capping a distraction-filled week for the Panthers. In his first start since fracturing his ribs in a preseason game, Newton threw for 281 yards and a touchdown and ran for 19 yards on four carries, He helped the Panthers improve to 2-0 for the first time since 2008 and grab sole possession of first place in the NFC South. 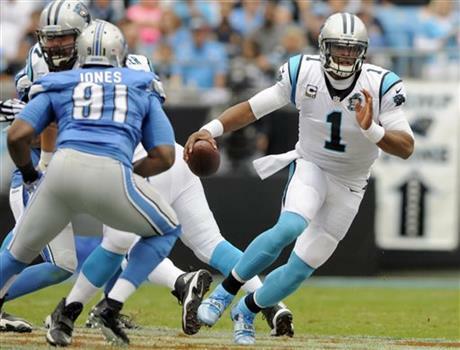 Newton shook off a slow start and completed 22 of 34 passes and overcame five sacks. Wearing a thick flak jacket, it took a while for Newton to find his stride. He scrambled from the pocket on one second-quarter run and dived headfirst instead of sliding. It was similar to the play against New England on Aug. 22 that left him with cracked ribs and sidelined him for the season opener against Tampa Bay. Later in the fourth quarter Newton ran again, turning the corner inside the 5 and diving toward the pylon. Hardy was convicted July 15 on two counts of domestic violence and Rivera didn’t think it was right to allow him to play given the events of the week. 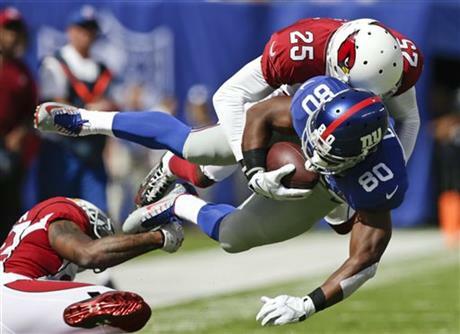 The Arizona Cardinals are finding ways to win, even without starting quarterback Carson Palmer. Offense, defense, special teams, everybody is chipping in. Ted Ginn Jr. ran 71 yards on a punt return for a go-ahead fourth-quarter touchdown, backup Drew Stanton was solid in his first regular-season action since 2010 and the defense forced three of New York’s four turnovers in a 25-14 win over the bumbling Giants on Sunday. It marked the second straight game the Cardinals (2-0) have rallied in the final quarter, and this comeback gave them their ninth win in 11 games. It also sent New York to its second straight loss and left many wondering if Tom Coughlin’s team is headed for another horrible start. Last year it was 0-6. Stanton showed his own level of confidence after finding out he would be starting less than two hours before kickoff. Palmer was experiencing a nerve problem in his shoulder. Stanton threw for 167 yards and led the Cardinals on three long scoring drives. Jonathan Dwyer scored on a 1-yard run and Chandler Catanzaro kicked field goals 49, 37, 32 and 33 yards, the shortest one a minute after Ginn’s electrifying return. The 37-yarder had come just before that and capped a 13-play drive that cut the Giants lead to 14-13 early in the fourth quarter. The lead had been set up by Eli Manning’s touchdown passes of 7 yards to Rueben Randle in the second quarter and 1 yard to Daniel Fells late in the third. The Giants went three-and-out after Catanzaro’s 37-yarder, with Victor Cruz dropping a third-down pass that would have been enough for a first down. They started slowly, finished sloppily and made too many mistakes in between. The New Orleans Saints were done in by their own sins. Two games into the season, they’re winless and have no one to blame but themselves. New Orleans couldn’t get a stop down the stretch as Brian Hoyer drove the Browns 85 yards in the final three minutes to set up Billy Cundiff’s 29-yard field goal with 3 seconds left, giving Cleveland a 26-24 win on Sunday in its home opener. The Saints (0-2) have been beaten two straight weeks by last-second field goals. Brees threw two touchdown passes to tight end Jimmy Graham and moved past Hall of Famer John Elway into fourth place on the NFL’s career passing list. But the Saints couldn’t overcome a terrible start. They fell behind 16-3 during the first half when they were forced to burn two timeouts, committed silly penalties and generally looked out of sync. Brees nearly had the second snap of the game sail over his head, and the high-powered offense never fired on all cylinders. Despite their issues, the Saints were in position to win when they pinned Hoyer and Cleveland’s offense back at its 4 with 2:46 left. But despite missing suspended wide receiver Josh Gordon and without injured Pro Bowl tight end Jordan Cameron and running back Ben Tate, Hoyer marched the Browns down the field to their first win in a home opener since 2004. Hoyer completed two passes on third down and kept the drive alive by firing a 10-yard strike over the middle to tight end Gary Barnidge on fourth down. With 15 seconds remaining, receiver Andrew Hawkins somehow got behind New Orleans defense and Hoyer lobbed him the ball down to the 11.
he Tampa Bay Buccaneers thought they were in a position for a game-winning field goal. Then an injury rule eliminated that chance. Greg Zuerlein’s fourth field goal of the day, a 38-yarder with 38 seconds remaining, gave the St. Louis Rams a 19-17 victory over the Buccaneers on Sunday. Bobby Rainey rushed for 144 yards and quarterback Josh McCown had two short touchdown runs for the Bucs (0-2), who moved the ball into St. Louis territory in the closing seconds only to have the game end when rookie Mike Evans was slow getting up after a 29-yard reception to the St. Louis 32. Officials stopped the clock with 8 seconds remaining and Evans was eventually helped off the field. But by rule, an injury in that situation requires a 10-second runoff, and the remaining time was wiped off the clock. McCown scored on runs of 1 and 5 yards. Rainey, filling in for the injured Doug Martin, helped the Bucs move into position for Patrick Murray to kick a 36-yard field goal to give Tampa Bay a 17-16 lead with 5:15 remaining. But a defense playing without tackle Gerald McCoy and middle linebacker Mason Foster couldn’t keep Rams quarterback Austin Davis from leading them on a 12-play, 71-yard drive to win the game. In addition to playing without Martin, the Bucs featured a new look on the defensive line with starting ends Michael Johnson and Adrian Clayborn out after being injured in the season opener. McCoy left with what appeared to be a left hand injury in the first half and Foster left in the second half. The Rams played part of the game without receiver Tavon Austin, who was injured when he was tackled by Mark Barron after a reception. McCown, a career backup entering a season as a starter for the first time in a decade, completed passes of 18 and 20 yards to Vincent Jackson before Rainey broke a 10-yard run to set up the quarterback’s second TD. The Bucs threatened again on their next possession, driving deep into Rams territory before Murray’s 26-yard field goal attempt was blocked by T.J. McDonald. 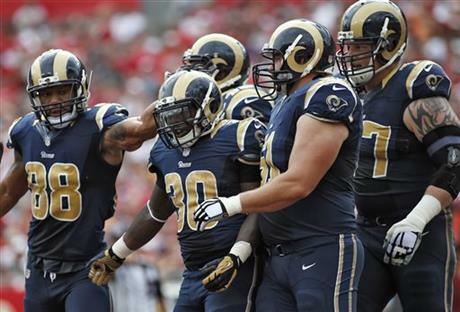 The Bucs also had a punt blocked, leading to a Rams field goal. 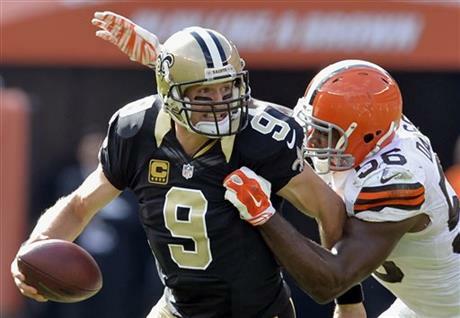 McCown also threw a first-quarter interception that stopped a drive inside the Rams 10. Davis completed 22 of 29 passes for 235 yards with no interceptions. Zac Stacy had a 2-yard touchdown run in the first quarter, and Zuerlein also made field goals of 36, 35 and 46 yards to help the Rams (1-1) rebound from a lopsided season-opening loss to Minnesota. With Sam Bradford out for the year with a knee injury and backup Shaun Hill also hurt, Davis made his first pro start after spending most of the past two seasons on the Rams’ practice squad. Stacy rushed for 71 yards on 19 carries and Brian Quick had seven receptions for 74 yards for St. Louis. Play was stopped for 51 minutes in the first half because of severe weather. Lightning forced players and coaches off the field with 6:03 remaining in the second quarter. They returned to the field after about 40 minutes in the locker rooms and were given an additional 10 minutes to warm up before play resumed with the score tied 7-7.
he San Diego Chargers didn’t need a 12th man against the Seattle Seahawks. The blazing sun sure helped, especially when the temperature on the field at kickoff reached 120 degrees. 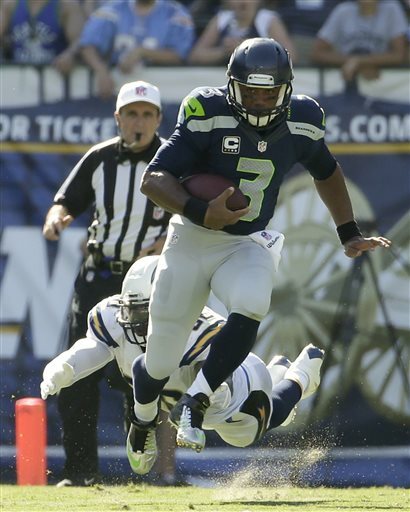 Seattle’s vaunted defense was on the field most of the game, unable to stop the Chargers. At one point, Thomas received an IV. The Chargers used an old, familiar combo — Philip Rivers to Antonio Gates — to upset the defending Super Bowl champion Seahawks. Gates had three touchdown catches, including a spectacular, one-handed grab, and the Chargers controlled the tempo to keep Russell Wilson and Marshawn Lynch off the field to beat the Seahawks 30-21 victory Sunday. The 34-year-old Gates scored on catches of 8, 8 and 21 yards. The 21-yarder was epic, as the star tight end split two defenders and extended for Rivers’ pass, reaching out with his left hand to gather it in. Flat on his back in the end zone, he held up the ball to show the referee he’d made the catch that gave San Diego a 27-14 lead late in the third quarter. The three touchdown receptions tied Gates’ career high. Rivers was 28 of 37 for 284 yards. Seattle was efficient when it had the ball, but it just didn’t have it enough as the Chargers dominated time of possession on a steamy afternoon at Qualcomm Stadium. San Diego (1-1) had blown an 11-point, fourth-quarter lead and lost its opener Monday night at Arizona. Seattle (1-1) had nine days to prepare after an impressive 20-point opening victory against Green Bay. Two long drives right down the field to open the game. Four turnovers, including a bizarre, two-fumble play destined to end up on a bloopers reel. The home opener for the Oakland Raiders had an all-too-familiar feel to the frustrated fans who have waited 11 seasons for a winning team. 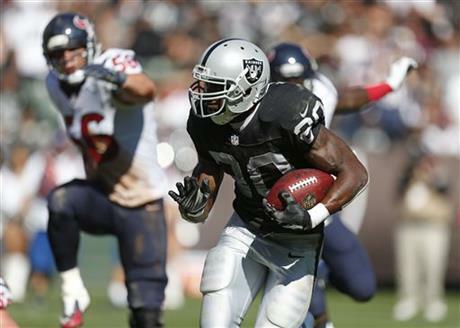 Derek Carr threw a pair of interceptions, James Jones and Mychal Rivera lost fumbles and the Raiders allowed Arian Foster to run free all afternoon for 138 yards in a 30-14 loss Sunday. Houston star defensive end J.J. Watt caught a 1-yard touchdown pass to cap the opening drive and Foster scored on a 5-yard run on the next possession for the Texans, who are off to a 2-0 start under new coach Bill O’Brien after losing their final 14 games a year ago. The Raiders (0-2) have lost eight straight games dating to last season and have shown no signs that an offseason overhaul has fixed the myriad of problems in Oakland. 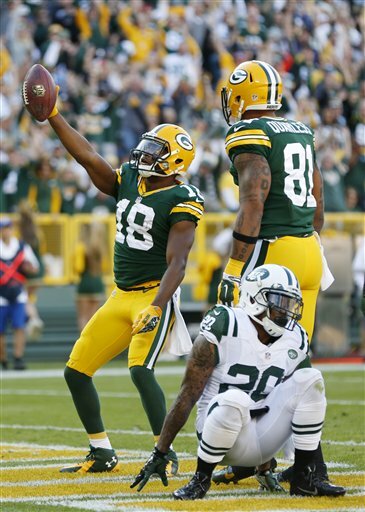 The day was summed up by James Jones’ double fumble late in the first half. Jones caught a 20-yard pass from Carr late in the first half before getting stripped by Joseph at the Houston 35. Jones picked the ball up and ran toward the end zone, but Joseph knocked the ball out again from behind and D.J. Swearinger recovered at the Texans 3. That was one of three turnovers in scoring territory by the Raiders. Carr moved Oakland down the field with a 41-yard run early in the second quarter only to negate that good play by throwing a pass that was intercepted by Kareem Jackson that set up Randy Bullock’s first of three field goals. Mychal Rivera then fumbled a catch early in the third quarter and Joseph returned it 49 yards to set up Ryan Fitzpatrick’s second TD pass of the game, a 12-yarder to DeAndre Hopkins that made it 24-0 and got the boo birds out in earnest. Fitzpatrick finished 14 for 19 for 139 yards to beat the Raiders for the third time in as many starts with as many teams. He led last-minute comebacks for Buffalo in 2011 and Tennessee last season before enjoying an easier win this time. In the middle of the chaotic and victorious Green Bay Packers locker room, Randall Cobb yelled out a new nickname for Jordy Nelson. More like a career-high 209 yards receiving for Green Bay’s top receiver, including one long touchdown catch in crunch time. Still, coach Rex Ryan’s team had a chance to tie late. It looked as though that had happened with 5 minutes left on a 37-yard touchdown catch by Jeremy Kerley on fourth down — but it was negated because the Jets (1-1) called a timeout from the sideline just before the snap. Ryan said he didn’t call time. He suspected it could have been offensive coordinator Marty Mornhinweg or quarterback Geno Smith. Defensive lineman Sheldon Richardson said he was to blame because he leaned over to tell the referee when he saw Mornhinweg calling for time. Smith’s last-ditch pass on fourth-and-8 with 3:31 left to a double-covered Kerley was tipped away. The 78,000-plus fans at Lambeau Field breathed a collective sigh of relief, and the Packers held the ball from there. 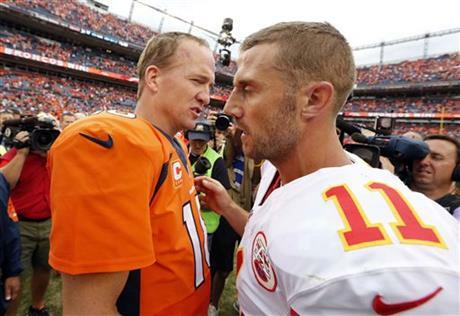 The injury-plagued Kansas City Chiefs did everything they were supposed to do against Peyton Manning and his Broncos. Well, except that one thing — scoring. The Chiefs lost two more key starters and were still only 2 yards away from tying the game late in the fourth quarter. Alex Smith’s pass with 15 seconds remaining was deflected at the line of scrimmage as the Denver Broncos held on for a 24-17 win on Sunday. For a second straight week, the Chiefs were hit hard by injuries; they lost All-Pro running back Jamaal Charles on the opening drive and safety Eric Berry in the second quarter to sprained ankles. Both will have X-rays on Monday. Still, thanks to an offense that held the ball for more than 36 minutes, which kept Manning on the bench, they were on Denver’s doorstep with a chance to tie late in the game, despite being 12½-point underdogs. In this loss, Kansas City (0-2) may have just provided the rest of the league with a blueprint for the Broncos (2-0) — keep the ball out of Manning’s hands. Although, that sort of goes without saying. But the Chiefs dominated time of possession (holding the ball for nearly 13 more minutes) and didn’t let No. 18 settle into his customary rhythm in the second half. Manning threw for just 51 yards after halftime. The only trouble was Kansas City kept sputtering inside the red zone, going 1 for 3 in the second half. The Chiefs’ final drive almost ended early — twice. But Aqib Talib’s interception for a score was negated by Quanterus Smith jumping offsides. Later, Nate Irving’s fumble recovery following DeMarcus Ware’s sack of Smith was ruled an incomplete pass after a review. Kansas City nearly capitalized, too, driving inside the 10 with 1:45 remaining. On fourth down, though, Smith tried to hit Dwayne Bowe over the middle but his pass was deflected by Terrance Knighton. olin Kaepernick has delivered two drastically different performances in prime time against the Chicago Bears, from that sensational first career start two years ago at Candlestick Park to the complete debacle in his Levi’s Stadium debut. Kaepernick threw two of his three interceptions in the fourth quarter and also lost a fumble, watching Jay Cutler rally the Bears from a late double-digit deficit to a stunning 28-20 win to spoil the first regular-season game in the 49ers’ new $1.2 billion stadium. Cutler connected with Brandon Marshall for two of his three fourth-quarter touchdown passes after much of Chicago’s starting defense went down. 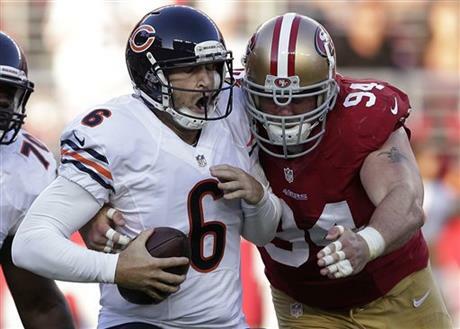 Cutler and Marshall clicked as Chicago erased a late 13-point deficit and quieted the sellout crowd. Cutler threw for two scores in a 27-second span early in the final period, aided by the gutsy play of a backup cornerback. Kyle Fuller made two late interceptions for the depleted Chicago secondary, and the first set up the go-ahead score. The Bears (1-1), in a stretch with six of eight games on the road, go home with some serious momentum despite injuries on both sides of the ball. Cutler finished 23 of 34 for 176 yards. Five key defenders are hurt: cornerbacks Sherrick McManis (quadriceps) and Charles Tillman (triceps), defensive end Trevor Scott (foot), safety Chris Conte (shoulder) and defensive tackle Jeremiah Ratliff (concussion). Trestman had no updates. The 49ers (1-1) had a 17-7 halftime lead, but missed an opportunity to grab an early lead in the NFC West after the defending Super Bowl champion Seattle Seahawks lost earlier in the day at San Diego. Nick Foles threw a tying touchdown pass with 3:25 to go, and then set up Cody Parkey for the winning 36-yard field goal as time expired, lifting Philadelphia to a 30-27 win at Indianapolis on Monday night. The Colts led most of the night, including 27-20 late in the game. 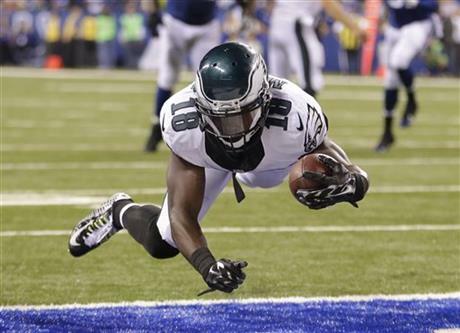 But Luck’s late interception led to Foles’ tying 6-yard TD pass to Jeremy Maclin, and after another three-and-out by the Colts, Foles drove the Eagles into position for the winning field goal. The Eagles’ potent offense started slow, managing just two field goals in the first half and failing to score a touchdown before LeSean McCoy’s 1-yard run with 4:32 left in the third quarter. They finished strong, tying it at 20 when Sproles managed to stay on his feet for a 19-yard run late in the third and again at 27 on a 6-yard TD pass to Jeremy Maclin. Luck drove the Colts right back down the field and hooked up with Ahmad Bradshaw for a tiebreaking score, but Indy couldn’t close it out and the Eagles took advantage.